In the evening of the 29th of Kiahk (Christmas Eve), and while the Christian congregation was gathered in church for the occasion and with Bishp Abadion leading the liturgy, the governor Irianos, in one of his fierce persecution expeditions, arrived with his soldiers to Akhmeem to kill all the Christians. The soldiers started by slaughtering the Christians inside the church until the holy blood of the martyrs flooded the streets of the village. When the Christians in nearby villages heard about the massacre, they courageously rushed to Akhmeem so as to receive the crown of martyrdom. 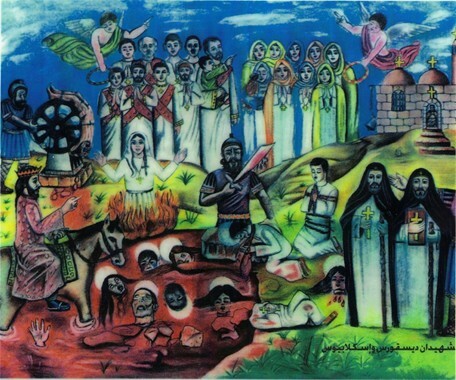 This massacre continued for three full days, and more than 8,140 Christians were martyred. Among them was a child named Zakaria (a son of a fisherman) who saw angels taking the souls of the martyrs and placing beautiful crowns on their heads. Seeing this, the child screamed with what he saw. Immediately, the governor, Irianos, cut the child’s tongue. However, the great Archangel Michael appeared and healed the child who continued to scream while sitting on his father’s shoulders. The governor then ordered that the child along with his father be thrown in the fire and both received the crown of martyrdom. Many people believed because of this and were martyred themselves. Because of its innumerable number of martyrs, Akhmeem was called the city of martyrs during the Coptic age. The monastery of the Martyrs in Akhmeem is rich with the relics of the saints, including those of St. Dioskorous and Sclabios and the 8,140 martyrs mentioned above. Innumerable miracles take place through their intercessions up to this day. May their prayers be with us and Glory to God for ever, Amen !